Miller listened to both sides argue their case Monday Feb 6, 2012 for about an hour before announcing he would render a decision at a later date. In expressing doubts that courts can allow animals to be plaintiffs in court proceedings, Judge Miller also expressed concern over just how far reaching such a decision could be, as he pointed out the Military’s use of Dolphins and Police use of dogs. Not mentioned in just how far such a decision could reach should the Judge decide on PETA’s behalf or how would it not also have to apply to household pets, service animals like seeing-eye dogs for the blind, zoos, farms anywhere animals are. How could those civil rights not also apply to the seals Orcas eat? 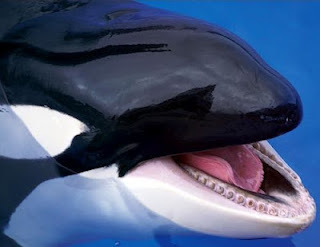 If a liberated Orca was caught killing and eating a seal, would the Orca be arrested and drug back to court for violating the seals civil rights or murder? While I am confident PETA would be well pleased if eating meat was outlawed, they don’t seem concerned that the handicapped could be left stranded or that domesticated pets released into the wild would not be able to fend for themselves and would be easy pickings for wild animals seeking food. Is there an issue the left doesn’t play the race card? Or does PETA not realize the civil rights movement in the 1960’s was for humans? A common retort in the homosexual marriage argument, whenever we mention a slippery slope that could lead to people being permitted to marry animals is that the animal cannot state they are agreeable to the marriage. So I am left wondering how five Orcas could have agreed to being retained by PETA in this lawsuit. Just how far will this insanity go? Is it any wonder so much of the rest of the world believes America is going absolutely insane?